We love any toy that encourages children to explore the world around them and learn something new. What better way to explore than with a pair of kid-friendly binoculars. Young explorers can pretend they are on an animal adventure with Jack Hanna or on an archaeological expedition with Indiana Jones. Or, maybe they dream of searching the galaxy for black holes and cosmic rays. Where ever their imagination takes them, they’ll be able to closely examine what they discover with one of the five top-rated binoculars for kids we’ve found to share with you. Oh, and let’s not forget, no batteries or assembly are required. But, before we get to our favorites, let’s talk for a moment about how binoculars are rated. With most binoculars, you’ll see two numbers in the description. Those numbers indicate the magnification power and lens diameter. The first number, the magnification power, indicates how close the object will appear to be. For example, a magnification power of 2 means the object is 2 times closer than what your eyes could see. The second number relates to the lens diameter in millimeters. The larger the diameter, the more light the binoculars can gather which yields a brighter view. It might sound complicated but when it comes to binoculars, determining the exit pupil is fairly simple. Just divide the lens diameter by the magnification power. The size of our eye pupil diameters grows smaller as we age. Therefore, when we are younger we need a binocular with a larger exit pupil. Children’s pupils can open as wide as 8mm. Map out an adventure and see the world with binoculars. We found dozens of binoculars designed for children being sold under a variety of different brand names. Many have excellent ratings and may prove to be a good product. However, we here at Cool Outdoor Toys, believe it might be a wiser investment to spend a little more and purchase a pair of binoculars from a more well-known manufacturer. Binoculars are all about the lenses. Historically, there have been only 31 different companies identified as “binocular manufacturers.” Most of them also manufacture cameras and/or telescopes too. These companies are recognized leaders in the field of optics. We went through their lower-priced offerings and found three we thought would work perfectly with kids. We chose one that was designed for rugged use and is waterproof, one the is small and compact and one that can let your little ones explore during the day or look to the heavens at night. 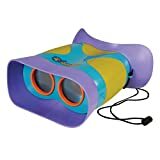 These kid-sized binoculars or Kidnoculars by Educational Insights appear to be the most widely available of the group. When we were researching this article, families had rated them, on average, 4.5+ stars on every site where they are sold. It was an easy choice to begin our list of best binoculars for kids with this very popular and highly rated toy. The concept of Kidnoculars is simple – a colorful and rugged pair of toddler and pre-school-sized, budget-friendly pair of binoculars. They are focus-free and fit perfectly on smaller faces. The edges and eye guards are made of soft rubber designed to protect children’s eyes and protect the lenses from damage when they toy is dropped. They also help youngsters position them properly on their face. Simplicity of design and ease of use do come at a bit of a cost – they offer only 2x magnification. Our suggestion would be that these could be ‘entry’ level binoculars for younger children prior to investing a little bit more for more features and a more real binoculars look and feel. However, the 2x magnification still provides a great way to introduce science to toddlers and preschoolers and make learning fun. They would also be good for viewing items up close in personal in the garden like insects, flowers and leaves. GeoSafari Jr. Kidnoculars were a 2013 Parent’s Choice Recommended Award Winner, included in Today’s Parents Magazine’s 2013 Ultimate Toy Guide and given a 3 Star Seal by the Canadian Toy Testing Council. The folks at Educational Insights are so sure your child will love their Kidnoculars that they offer a 365 day risk-free guarantee. These binoculars measure 7 x 5.8 x 2.8 inches and weigh 8.5 ounces. They also have a 4x/30mm model that measures 4.3 x 4.3 x 1.6 inches and weighs 6.4 ounces; however; it’s a little harder to find and has slightly less enthusiastic reviews. The Think Peak Toys Binoculars for Kids appears to be less widely available. However, Amazon shoppers had few, if any, complaints when we wrote this article. It was rated even more highly than the Kidnoculars. They also fall somewhat in between “adult binoculars” and binoculars for kids in style, design and weight. Like the Kidnoculars , they have rubber eyepieces and an overall kid-friendly design. But, unlike the Kidnoculars, these 8×21 binoculars will provide a more realistic experience for your budding naturalist. With up to 8X magnification and a kid-sized focus wheel; kids will be able to see further and with greater clarity than with the Kidnoculars. We do wonder though if younger children may find the adjustable focus more difficult to use. Unlike the Kidnoculars, these binoculars can be adjusted to match your child’s eye to eye distance. The Think Peak Toys Binoculars for Kids sports a 7.2 viewing angle that increases what can be seen when the world is viewed through their BAK-4 roof prism lenses. According to the folks at REI, Roof prism binoculars, “tend to be slim and compact, making them a good choice for hiking and other outdoor activities. It takes a bit more precision to make binoculars with roof prisms, so these are typically more expensive than those with Porro prisms. 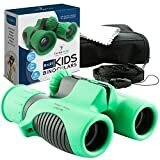 When ordering these binoculars for kids, you’ll receive real optics 8×21 Kids Binoculars, a protective carrying case with belt loop, instruction manual, double breakaway neck strap, cleaning cloth and a family camping eBook. Think Peak Toys offers a 30 day money back warranty and a lifetime free replacement warranty if your binoculars are broken. These binoculars measure 4.4 x 4 x 1.5 inches and weigh 8.8 ounces. These compact binoculars will set you back about twice as much as the two kids binoculars, however, they have a higher magnification level and are made by one of the foremost binocular manufacturers in the world. Bushnell has been in business since 1948 and also sells telescopes, scopes, GPS devices, laser rangefinders, game cameras, night vision and other optical equipment. Bushnell does make a few models that are priced a little less than this model, however, we recommend these for kids because they are fully waterproof and armored with a rubber coating to absorb shock and provide a firm grip – a better choice for boys and children who tend to be rough with their toys. The eye cups are adjustable for eyeglass wearers. These binoculars come with two lens options a 10X25mm and an 8 x 25mm. If buying for a smaller child or a child who might have trouble holding the binoculars steady, we recommend the 8x25mm model. Additionally, the 8X25 model has an exit pupil that should be more comfortable for children. Both offer BaK-4 prisms and multi-coated optics for clear images and improved light transmission. 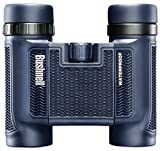 The Bushnell H20 Waterproof Compact Roof Prism Binoculars weigh 12 ounces and measures 5 x 4 x 2.75 inches. While not listed in the product description, one helpful reviewer mentioned that they received the binoculars, a strap, case, lens cleaner and a manual. They also carry a limited lifetime warranty. We included these binoculars because they are small and extremely light-weight. In fact, several reviewers mentioned them being perfect for use by children. However, the exit pupil is a bit small for children. Tasco is a major distributor of consumer telescopes. They also make binoculars, gun sights and terrestrial scopes. They were founded in 1954 and are based in Overland Park, KS. While not waterproof or identified as being ‘rugged’, the ES16X32 model weighs only 10.22 ounces. When folded, they measure 5.5 long x 3.25 wide by 1.5 thick and 4.5 inches wide when unfolded. Without internal gyro stabilization to help with image stability, this model may not be a good choice for younger children or children who may have trouble holding them still. We found a number of recommendations against using folding binoculars for children because the lenses are too small. However, the large 32mm lenses on the Tasco Essentials provides the best of both worlds – light-weight and small but with lenses typically found in larger models. It comes with a case and neck chord. The only hesitations we have in recommending these binocular for kids is the exit pupil is fairly small and they might not be as rugged as the binoculars we’ve already discussed. The Cometron binoculars by Celestron are our favorite binoculars for kids. Toddlers might enjoy the Kidnoculars or Think Peak Toys Binoculars more, but, for older children we think these are clearly the coolest among the binoculars we researched for this articles. The 50mm objective lenses and multi-coated optics have the highest light-gathering capabilities. Which means, they’re great for kids and they can used for comet watching, stargazing and checking out the craters on the moon. How cool is that? Binoculars that can also be used like a telescope. They are also the only binoculars on our list that are tripod adaptable. The Cometron has a wider exit pupil which is a better fit for young eyes. And, with the slightly smaller magnification it’s a better choice for children who may have trouble holding their binoculars steady than the Bushnell or Tasco. The wider lenses do add weight. The Cometron weighs 27 ounces – still among the binocs classified as “light weight”. And, this type of lens does not focus as well for things that are closer than about 30 feet. The Cometron also has Porro lenses, which are generally preferred for astronomy, but can work well for terrestrial explorations as well. They are listed as only being ‘water resistant’. This pair of binoculars comes with a carrying case, objective covers, eyepiece covers, lens cloth and instruction manual; and has a 2-year warranty. Space.com; which covers space exploration, innovation and astronomy news; rates the Cometron as their Runner-Up for best small binoculars for Skywatchers. Their top pick routinely sells for over $150 and third place model can be over $1,000. And, it might be worth noting that other Celestron binoculars were their top picks for medium and large-sized binoculars for star-gazing. Kites for kids, let's fly a kite!